Zoe shares her experience of living with Cushing’s disease, a rare condition that develops when your body produces too much of the hormone cortisol. The commonest cause of spontaneous Cushing’s disease is a small benign tumour in the pituitary gland. Symptoms usually develop gradually and so the diagnosis may not be clear for some time. Watch and share Zoe’s story to raise awareness of this rare condition. I am amazed at how well this Challenge went this year, giving that we’re all Cushies who are dealing with so much. I hope that some folks outside the Cushing’s community read these posts and learned a little more about us and what we go through. So, tomorrow, I’ll go back to posting the regular Cushing’s stuff on this blog – after all, it does have Cushing’s in its name! I am trying to get away from always reading, writing, breathing Cushing’s and trying to celebrate the good things in my life, not just the testing, the surgery, the endless doctors. If you’re interested, I have other blogs about traveling, friends, fun stuff and trying to live a good life, finally. Those are listed in the right sidebar of this blog, past the Categories and before the Tags. People often ask me how I found out I had Cushing’s Disease. Theoretically, it was easy. In practice, it was very difficult. I found the row with my symptoms and the answer read “…ask your doctor about Cushing’s”. After that article, I started reading everything I could on Cushing’s, I bought books that mentioned Cushing’s. I asked and asked my doctors for many years and all of them said that I couldn’t have it. It was too rare. I was rejected each time. Due to all my reading at the library, I was sure I had Cushing’s but no one would believe me. My doctors would say that Cushing’s Disease is too rare, that I was making this up and that I couldn’t have it. In med school, student doctors are told “When you hear hoofbeats, think horses, not zebras“. According to Wikipedia: “Zebra is a medical slang term for a surprising diagnosis. Although rare diseases are, in general, surprising when they are encountered, other diseases can be surprising in a particular person and time, and so “zebra” is the broader concept. So, doctors typically go for the easily diagnosed, common diseases. Just because something is rare doesn’t mean that no one gets it. We shouldn’t be dismissed because we’re too hard to diagnose. When I was finally diagnosed in 1987, 4 years later, it was only because I started bleeding under the skin. My husband made circles around the outside perimeter each hour with a marker so my leg looked like a cut log with rings. When I went to my Internist the next day he was shocked at the size of the rings. He now thought I had a blood disorder so he sent me to a Hematologist/Oncologist. Fortunately, that new doctor ran a twenty-four-hour urine test and really looked at me and listened to me. Both he and his partner recognized that I had Cushing’s but, of course, couldn’t do anything further with me. They packed me off to an endo where the process started again. My final diagnosis was in October, 1987. Quite a long time to simply “…ask your doctor about Cushing’s”. I had found out that I had my kidney cancer on Friday, April 28, 2006 and my surgery on May 9, 2006. I was supposed to go on a Cushie Cruise to Bermuda on May 14, 2006. My surgeon said that there was no way I could go on that cruise and I could not postpone my surgery until after that cruise. I got out of the hospital on the day that the other Cushies left for the cruise and realized that I wouldn’t have been much (ANY!) fun and I wouldn’t have had any. An especially amusing thread from that cruise is The Adventures of Penelopee Cruise (on the Cushing’s Help message boards). Someone had brought a UFC jug and decorated her and had her pose around the ship. Penelopee had a lovely time on Explorer of the Seas which was a five day cruise to Bermuda. She needed something to cheer her up since her brother, Tom, went off the deep end, but that’s another story! Penelopee wanted to take in all of the sights and sounds of this lovely vessel. Every day she needed to do at least one special thing. Being a Cushie, she didn’t have enough spoons to do too much every day. On the first day, she went sunning on the Libido deck……she didn’t last too long, only about 10 minutes. Goodness, look at her color! Do you think maybe her ACTH is too high? Although I missed this trip, I was feeling well enough to go to Sedona, Arizona in August, 2006. 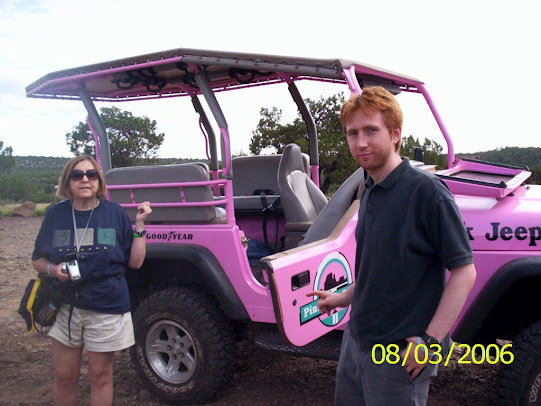 I convinced everyone that I was well enough to go off-road in a pink jeep, DH wanted to report me to my surgeon but I survived without too much pain and posed for the header image. In 2009, I figured I had “extra years” since I survived the cancer and I wanted to do something kinda scary, yet fun. So, somehow, I decided on ziplining. Tom wouldn’t go with me but Michael would so I set this up almost as soon as we booked a Caribbean cruise to replace the Cushie Cruise to Bermuda. Each person had a harness around their legs with attached pulleys and carabiners. Women had them on their chests as well. In addition, we had leather construction gloves and hard hats. We climbed to the top of the first platform and were given brief instructions and off we went. Because of the heavy gloves, I couldn’t get any pictures. I had thought that they would take some of us on the hardest line to sell to us later but they didn’t. They also didn’t have cave pictures or T-Shirts. What a missed opportunity! This was so cool, so much fun. I thought I might be afraid at first but I wasn’t. I just followed instructions and went. Sometimes they told us to brake. We did that with the right hand, which was always on the upper cable. After the second line, I must have braked too soon because I stopped before I got to the platform. Michael was headed toward me. The guide on the end of the platform wanted me to do some hand over hand maneuver but I couldn’t figure out what he was saying so he came and got me by wrapping his legs around me and pulling me to the platform. After that, no more problems with braking! The next platform was very high – over 70 feet in the air – and the climb up was difficult. It was very hot and the rocks were very uneven. I don’t know that I would have gotten to the next platform if Michael hadn’t cheered me on all the way. We zipped down the next six lines up to 250-feet between platforms and 85-feet high in the trees, at canopy level. It seemed like it was all over too soon. But, I did it! No fear, just fun. Enough of adventures – fun ones like these, and scary ones like transsphenoidal surgery and radical nephrectomy! The cruise was uneventful, other than the usual mishaps like hitting docks, missing islands and so on. Until it was a particularly rough sea one day. I was walking somewhere on deck and suddenly a wave came up over the deck making it very slippery. I fell and cracked the back of my head on the curved edge of a table in the dining area. I had the next-to-the-worse headache I have ever had, the worst being after my pituitary surgery. At least after the surgery, I got some morphine. I’ll never know if that hit on my head contributed to my Cushing’s but I have seen several people mention on the message boards that they had a traumatic head injury of some type in their earlier lives. Somedays, it’s hard even getting up in the morning but I’m trying. I’ve tried Water Aerobics for People with Arthritis and I actually went to class twice a week, I got a “part-time” job several years ago, my son and I will play at Steinway Hall in NYC again in June, we have plans for another trip to Scotland (But we won’t get to see/hear the Edinburgh Tattoo again this time). This year, we plan to try to go to Lockerbie, as well! This is the one and only life I’ll ever have and I want to make the most of it, to the best of my ability! So often during the diagnosis phase of Cushing’s I felt like this picture – I was walking alone to an unknown place with an unknown future. All my research led me to Cushing’s. Unfortunately, the research didn’t lead me to doctors who could help for several years. That contributed greatly to the loneliness. If a Doctor says you’re not sick, friends and family are going to believe the doctor, not you. After all, he’s the one trained to know what’s wrong, or find out. I was so grateful when I finally got into a clinical trial at NIH and was so nice not to be alone with this mystery illness. I was also surprised to learn, awful as I felt, there were Cushies much worse off than I was. I am so glad that the Internet is here now helping us all know that we’re not alone anymore. Mary, I am delighted to see you here. Cushings – because of the persistent central obesity caused by (we know now) the lack of growth hormone plus the hypothyroidism I was diagnosed with (but for which treatment was ineffective due to my lack of cortisol) – was one of the things I considered as an explanation for my symptoms. Your site was enormously educational and helpful to me in figuring out what might be happening to me. Those other patient testimonies I referred to? Many of them were the bios you posted. Thank you so much for commenting. I am so grateful for the support and encouragement. I really hope that my experiences will help other undiagnosed hypopituitary patients find their way to a diagnosis. I often used to dream that one day I’d get to say to others what was so often said to me: don’t give up, there will be an answer. I kept believing in myself because people I hadn’t even met believed in me. Now I am finally here and I do hope my story will help others to have faith in their own instincts. Thanks again. Please do keep in touch.